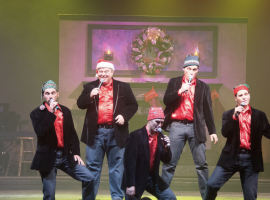 The Hughes Brothers Christmas Show is a performance dedicated to celebrating Christmas. The brothers sing Christmas classics throughout the entire night. Their family members join them as they dance and sing! The Hughes Brothers have one of the largest performing families. Another neat fact is that this show is one of few that actually has an entire Christmas show. During the first half, many fun Christmas sing along songs are performed. During the second half, the true meaning of Christmas is told by Santa Claus. If you look close enough, baby Jesus is actually one of the Brother’s kids. In fact, they have had a different live baby Jesus on stage for about the last 20 years! This is definitely a Christmas show to put on your list to see. It is a great variety show that is filled with great music, awesome dancing, and incredible stories told about the true meaning of Christmas! Don’t miss it!